1 Second-degree type II 6 High-grade—2:1, 3:1, etc. Dropped beat with no PR increase Every other P not conducted, 2 consec P waves not conducted, etc. AVN = atrioventricular node, HPS = His-Purkinje system, PPM = permanent pacemaker, sx = symptoms, HBE = His bundle electrogram. Fig. 2. A 74-yr-oid man with a history of right bundle-branch block (RBBB) and left anterior fasicular block was admitted to the hospital after a syncopal episode. 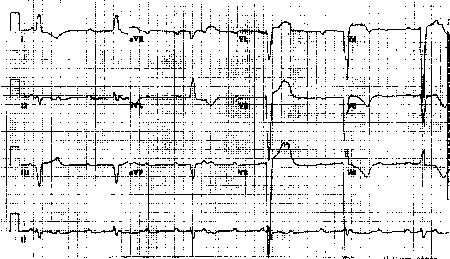 Complete heart block with a wide-QRS-complex escape rhythm was noted on his ECG, and a temporary pacemaker and later a permanent pacemaker were inserted. 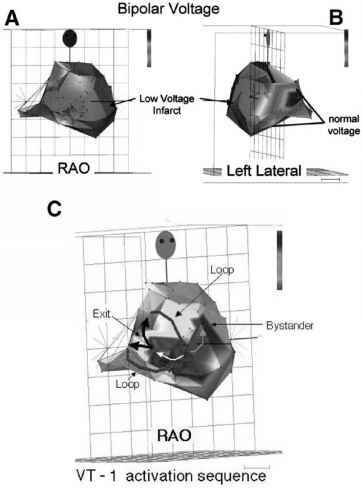 Approximately two-thirds of patients presenting with complete heart block and a wide-complex escape rhythm had antecedent RBBB with left anterior fasicular block. specialized conduction system. The traditional electrocardiographic categorization of AV block is presented in Table 2. 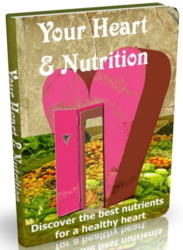 Cells of the conduction system possess a property called automaticity; i.e. the ability to depolarize spontaneously. In general, the rate of depolarization is highest in the SA node and decreases progressively with descent through the conduction system. Thus, from a functional and therapeutic standpoint, the level at which the block is located is more important than the electrocardiographic classification. Block at the level of the AV node is usually associated with a junctional escape rhythm (and a narrow QRS complex). The escape rhythm tends to be reliable, the rate is characteristically adequate (e.g., 50-60 BPM) and responds to autonomic interventions (such as atropine) because the node has extensive sympathetic and para-sympathetic innervation. In contrast, block within the His-Purkinje system is associated with an idioventricular escape rhythm characterized by a wide QRS complex (Fig. 2) that is morphologically different from the conducted beats. It tends to be considerably slower and less reliable than a junctional escape rhythm, and is relatively unaffected by autonomic maneuvers. a. symptomatic bradycardia, either spontaneous or as a result of drug therapy that is required for treatment of other conditions. b. Documented periods of asystole >3 s or any escape rate <40 BPM. c. Following catheter ablation of the AV junction. d. Postoperative block that is not expected to resolve. e. Neuromuscular diseases with complete AV block such as Kearns-Sayre syndrome. 2. Second-degree AV block associated with symptomatic tachycardia, regardless of site or type of block. Class Ila: 1. Asymptomatic complete AV block with an average rate of >40 BPM while awake. 2. Asymptomatic type II second-degree AV block. 3. Asymptomatic type I second-degree AV block regardless of site. 4. First-degree AV block with symptoms suggestive of pacemaker syndrome and documented improvement with temporary dual-chamber pacing. Class lib: 1. PR interval >0.30 s in symptomatic patients with left ventricular dysfunction in whom it has been demonstrated that shorter AV delays improve hemo-dynamics. Class III: 1. Asymptomatic first-degree or type I second-degree AV block.